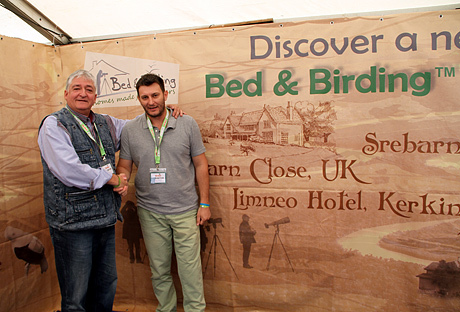 We are delighted to announce that Bed & Birding has recently welcomed five new partners from Greece, Bulgaria, Finland, UK and Peru. 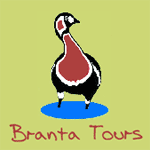 Collectively they embrace highly diverse and internationally important birdwatching (and other wildlife) areas. We are building an impressive chain of local nature-oriented partners along the fabulous coastal wetlands of the western Black Sea region and Danube River. Other members of our expanding accommodation network cover the northwest coast of England, the Baltic Sea, Mediterranean woodlands and the core of the Amazonian rainforest. 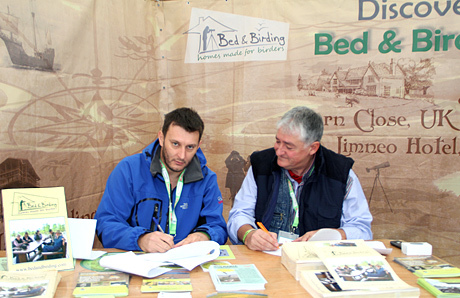 during the British Bird Fair 2014. 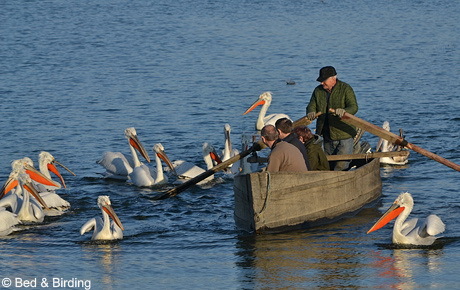 Dalmatian Pelicans are a typical feature of Kerkini Lake in Greece. Pavel Simeonov (left) and Nikos Gallios (right) exchanged warm greetings, congratulating each other.